1) Lay the fillet on a cutting board, skin side down. 2) On the narrower tail end, make a cut between the skin and the flesh that is deep enough so that you can grab the skin with your other hand. 3) Put your knife at a 45 degree angle to the cutting board, grab the skin with your other hand, and simply hold the knife(almost as if you are scraping the skin) while you pull the skin with your other hand. 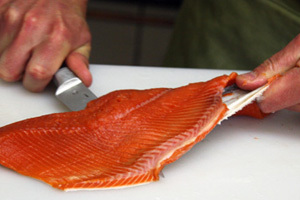 This technique, which is demonstrated below using a King salmon fillet, takes some practice and good knife skills, but it is the best method. So if you’re as challenged as I am at filleting fish, give this a go.